Does the T3610 support booting to PCI-e 3.0 NVMe drives? I'm trying to get this configuration to work, but I'm having a heck of a time. I'm running the latest BIOS version A11, and it is configured for UEFI boot. I have a USB installation drive that is formatted with a GPT partition using FAT32. I pick F12 at startup, pick my USB drive from the UEFI section, and install Windows just fine. The Windows installation process sees my NVMe drive with no trouble, and installs to it just fine. However, after the install is finished, I reboot and it won't boot to the NVMe drive. Has anyone gotten this to work on a T3610? The 3610 doesn't have this afaikt. Yes, GPT FAT32 is definitely a thing. However, if you read my post I was referring to the USB drive that contains the Windows 10 install. It must be formatted like that to install Windows 10 to a UEFI/GPT hard drive. See this guide from Paul Thurrott for more details, particularly the part about using the Rufus tool and the settings for that. He says to format the USB boot drive with GPT partition and FAT32 filesystem. I've also found this same guideline on multiple other sites. The T3610 BIOS sees the PCI-Express drive. 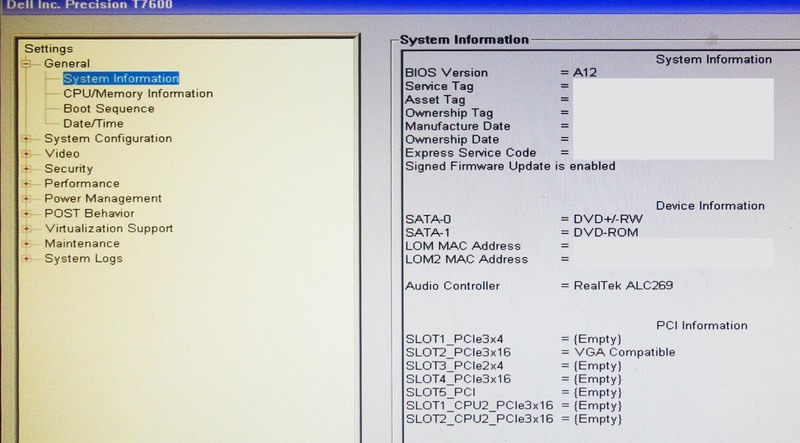 Take the T7600 BIOS screenshot as an example. I have my PCI-E drive plugged into Slot 1. My BIOS shows Slot 1 = Mass Storage. I'm going to assume without a BIOS update (that I know is never coming) then this will never work. I don't need to use Rufus when I can get an ISO of windows 10 and windows 10 NOT FAT32 Formatted media is available directly from microsoft. System builder versions of the disc are out for Home and Pro. Retail windows 10 is a usb flash drive that works with 32 or 64 bit and has home or pro on the same media. It differentiates between the two via the Key on the card in the box. Thanks again for the reply, but you're not helping with my original problem/question. Downloading an ISO file from Microsoft is great. But, you can't just say "blank hard drive, here's an ISO file, load it and start working". You have to take the ISO file, extract the contents of it, make a bootable USB drive and then put the contents of the ISO file onto the USB drive. Then you boot your computer from the bootable USB drive and load Windows. That bootable USB drive can be formatted multiple different ways. GPT partition with NTFS filesystem. GPT partition with FAT32 filesystem. MBR partition with FAT32 filesystem. You get the point. A rule of them is that a modern UEFI BIOS does not support booting from USB drives that are GTP/NTFS, that instead it should be GPT/FAT32. In doing some research I've found that support for booting to USB with GPT/NTFS in increasing. See this link for details. I could argue back and forth with you all day about this. But, my original question/problem still stands. My T3610 will not boot to my NVMe drive connected to PCI-Express. Your 3610 will NEVER boot NVME because support for this DOES NOT EXIST in bios. The media creation tool allows you to make bootable DVD or Bootable USB. Rufus is not required at all. The only reason I save ISO is so that I can make more DVD later. DVD media does not retain data long enough. USB Flash has a De trapping issue as well. You seem to be very hung up on your dislike of Rufus. It works great and is a highly regarded tool. I'm not sure why you keep focusing on that. Again, that's not helping with my original problem. I would like an official answer from Dell. My machine has multiple PCI-Express 3.0 slots. It has a UEFI BIOS that supports Secure Boot. All of the pieces are there. Dell just needs to put out a BIOS update that enables the system to boot from NVMe PCIe storage, that's all. I would like an official answer from Dell. Do you have an official list of systems that support booting from NVMe PCIe storage? Do you have a list of systems that will be getting upgraded BIOS to support this? Argue all you want about Rufus, and DVD, and USB, it's not what I'm concerned about and not the question in the original post. Unfortunately, your answer is probably the one you already know: the system's BIOS doesn't support booting an NVMe drive. These did not exist when the system was current, about three years ago. It's further unlikely you'll see any BIOS update to add support for NVMe -- the system's age puts it at "end of life", meaning it won't see any further updates. 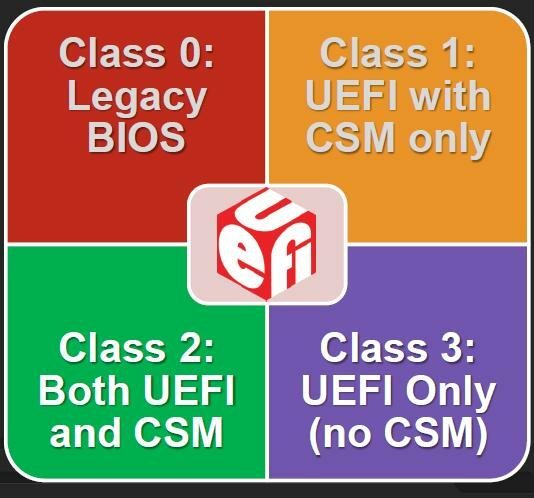 Windows 7 does not support native UEFI booting without a Compatibility Support Module(CSM). As a result, system compatibility is limited and varies by vendor. In order to properly boot Windows 7 from an NVMe SSD, your system must support loading UEFI drivers when the Compatibility Support Module (CSM) is enabled. NVME booting (as an option in bios) came out much later. Most of your information is correct. However, for future audiences looking at this post I would like to point out some things. The guide you referenced talks about 4 different chipsets that support NVMe boot. It gives examples for motherboards that use these chipsets: H77 (with a BIOS dating back to 2013), Z87, Z97, and X99 chipsets. Also, that guide is old, there are newer chipsets that support it as well, such as the Z170. For older motherboards, it all comes down to the motherboard vendor and if they will ever update the BIOS to support NVMe boot. In my case, with my Dell T3610, I'm just going to quit asking, and assume Dell will never update the BIOS to support NVMe boot.